Florida Book News: 2011 Annual Space Coast Post Card Show! 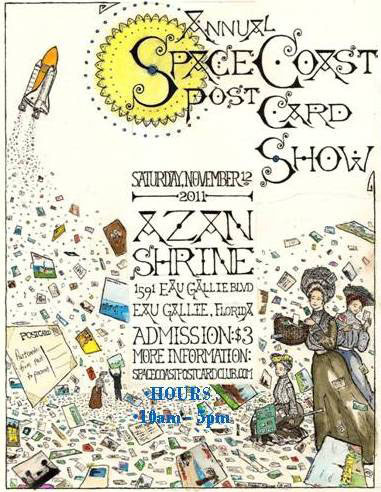 Sponsored by the Space Coast Post Card Club will be held Saturday, November 12, 2011, 10 a.m. to 5 p.m., at the Azan Shrine Temple, 1591 W. Eau Gallie Blvd. Melbourne, FL. Admission is $3 for anyone over 12 years-old; free for children under 12; US military veterans get in free with proper military identification.